Why we are so different? Because we supply part rolls of Membrane and part boxes of plugs! You can buy Waterproofing Membranes by the metre - click here to see typical prices of Membrane Kits. We assemble your chosen lengths of Membrane, quantities of plugs and seals, tape and mastic, to provide you with exactly the Kit you need for your Project - no need to waste money on complete rolls or full boxes - just give us the wall and floor dimensions and we will give you the most competitive price for your exact needs. Wall Lining Damp Proof Membrane Kit - new, easy to install, plastic membrane, so no rendering, no mess, no smell and easy DIY fix with bang-in plastic plugs, covered in mesh ready to plaster. Click here to see the fixing process for the Mesh and Non-Mesh versions. As used by the professionals - not all damp proofing membranes are made to these high standards, so beware of cheap imitations. Fit a Wall Membrane - Kontract or Mesh Membrane - drill a hole, bang in plug. Waterproof Membrane showing the mesh side, ready for direct plastering with normal 'bonding' plaster. 3. No special tools required, just drill 8mm holes. Lay a floor Membrane - Kontract or Slimline Floorseal - roll out, fix joint tape. Waterproof Membrane with no mesh, ready for direct flooring - concrete screed or wooden floor using chipboard flooring. 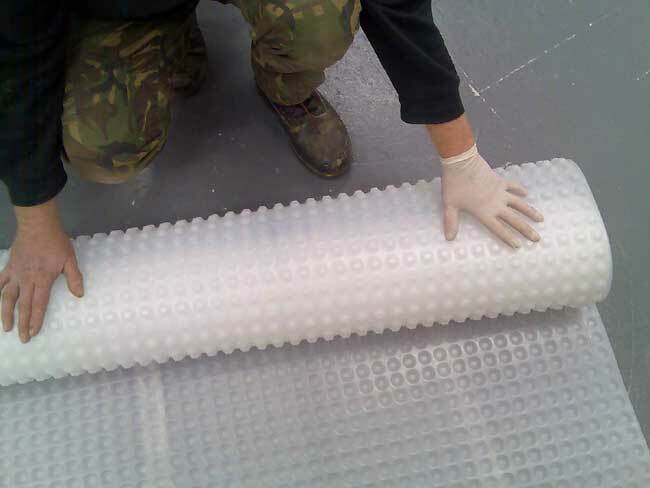 As used by the Trade: Membrane without Mesh can be used on floors or walls. On walls battens are fixed to the plug heads with screws, for lining with plasterboard, with or without Insulation. 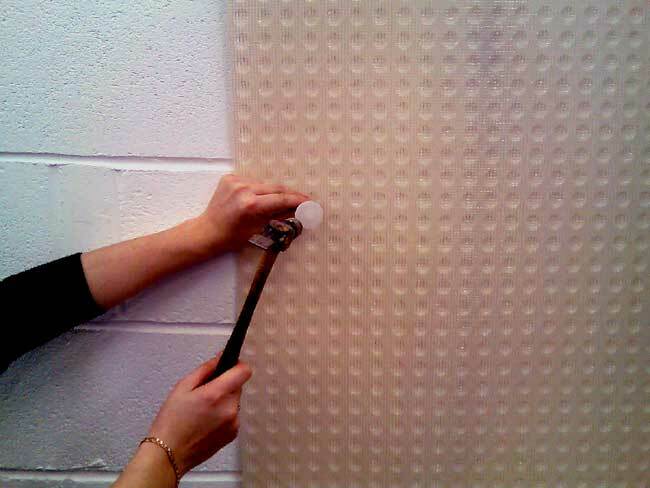 Waterproof membranes, made of studded membrane polyethylene, are ideal for lining damp walls and damp floors. Cellar conversions can also use this technique as a form of tanking, although traditional cement based tanking still has its place. Waterproof membrane used in cellar tanking is ideal for DIY Damp Proofing because it is so easy to fix and seal. The outcome is a dry basement conversion with rooms that can be decorated and inhabited as if above ground. Tanking membrane is also sometimes referred to as an air gap membrane because it is studded or dimpled. The studs touch the wall and create an air space This is a good insulator, reducing the risk of Condensation. membrane materials - plastic dimpled sheet on a roll. Easy to cut and trim with scissors or knife. sealing and fixing - special Mastic Rope and Tape, with plugs to suit both wall fixing methods. floor option - for damp floors, or basements use our membrane without the mesh - just lay chipboard flooring or screed directly onto the waterproof membrane. Quick DIY Master Class in Dampness and Condensation - become your own Expert in 1 hour! Buy our "Dampness in Buildings" reprinted book by the great expert Graham Coleman. A great read, short and to the point.